Are you in need of concrete or crack repair? If you own a building or parkade, you may be in need of concrete or crack repair. In Vancouver, Coquitlam, and other nearby areas, Polycrete Restorations has developed a reputation for being the go-to professionals for all concrete repairs. We’ve been serving the Lower Mainland since the 70’s and have worked on a number of recognizable heritage buildings, high-rises, educational facilities and shopping centres in the area. Undoubtedly, we can also help you resolve your own concrete woes. We approach crack repair in concrete surfaces with a method called honeycombing. We’ll arrive at your Vancouver edifice and utilize an epoxy pressure injection procedure to ensure a resilient and enduring resolution. Thanks to specialized equipment and our highly skilled workers, we can get the job done quickly. This means we can minimize any inconvenience to yourself or tenants in the building. We’ll repair all degraded concrete and even replace badly rusted reinforcement steel. Hairline fractures can probably be ignored, but any rupture as wide as a pencil or even wider needs to be resolved. This is especially true of surfaces that will be walked or driven on because such breaks present a safety hazard. But all substantial cracks are prone to becoming points of entry for water and could possibly lead to the breakdown of the structural integrity underneath. It’s therefore best to have deteriorating concrete repaired. Shrinkage. 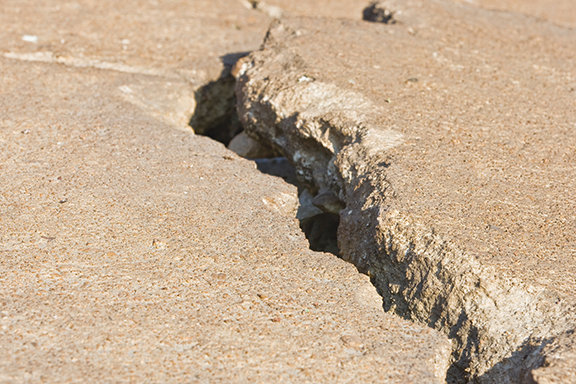 As concrete dries and settles, it shrinks by about 1%, which often leads to hairline cracks in the surface. Faulty construction. The particulars could include anything from improperly placed rebar to poorly mixed concrete. The ground under the concrete moves. These type of cracks are called settlement cracks. Temperature changes. When the environment changes from cold to hot (freezing to thawing), this places stress on the concrete and could lead to cracking. Contact with an unfriendly chemical. The most common culprit is salt. Cracks. Because moisture tends to penetrate existing cracks and eventually leads to the corrosion of the rebar underneath, which in turn affects the solidity of the concrete, cracks often cause more cracking to occur in the concrete. If you’re in doubt as to whether your concrete needs repair, the best recourse is to bring in an expert. Polycrete Restorations provides concrete repair services in Vancouver, Coquitlam, and surrounding areas in the Lower Mainland. Our commitment to quality work that’s on time and on budget sets us apart. Contact us today to schedule a free consultation.